It's January, and there's one thing I can conclude for sure: it is dark, and it is cold. When I went to the gym this morning, the sun was bright and even somewhat warm - it literally brightened my mood. Afterwards, however, the sky darkened and clouds simply started smashing hail unto my poor hands and face while I was trying to bike home. I love winter when it is either snowy or sunny, but the weather in the Netherlands right now is just nasty and wet. Do you know what that calls for? A good, wholesome breakfast that keeps you energized and gives you enough power to get through this horrible month. For this blog post, I decided to share some of the breakfasts I have been eating in the past few weeks. You should not see these as recipes to follow exactly (although you could), but I am just sharing them to give you some inspiration. If you know me, you know that I am a huge fan of eating oatmeal in the morning. Not immediately after waking up, but at around ten o'clock I'm usually craving some healthy carbs and sweetness. 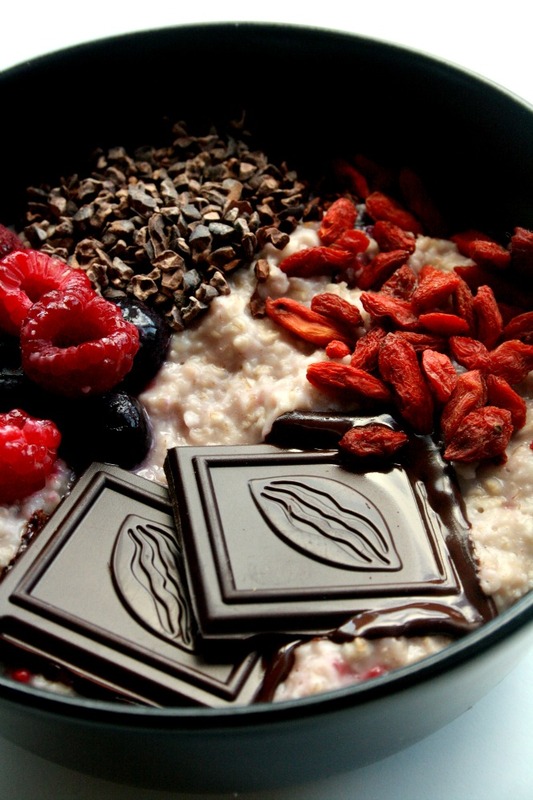 This oatmeal with chocolate and berries is perfect on that occasion. Ingredients: gluten free oats, unsweetened almond milk, vanilla extract, stevia, blueberries and rasperries, dried goji berries, cacao nibs, and of course some extra dark chocolate. 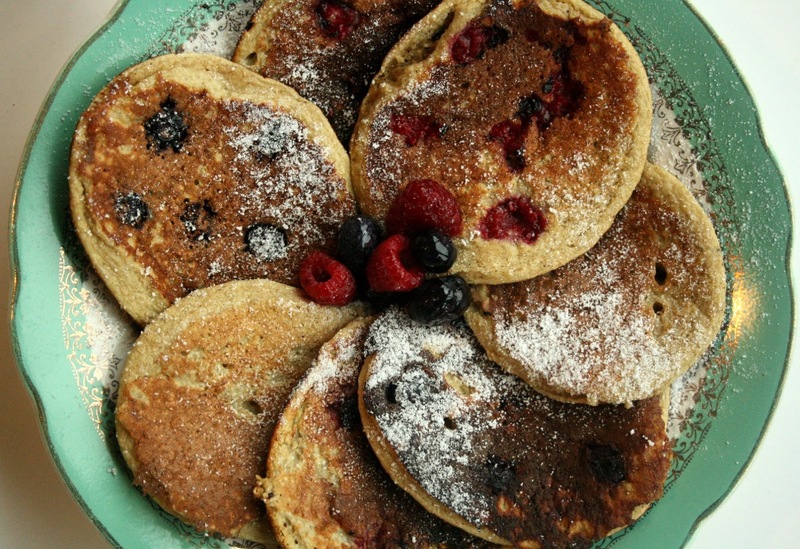 I have shared a recipe on my blog for Gluten Free Banana Pancakes before, and I eat those at least once a week. There are so many healthy fats, protein, vitamins, and complex carbs in just a few of these pancakes, that you could simply not deny how good they are for you. I do add some baking powder to them nowadays, and I like to spice them up sometimes as well. This time I decided to make them nice and fruity with some blueberries and raspberries. Ingredients: banana, eggs, oats, baking powder, vanilla extract, blueberries, raspberries, and stevia to sprinkle on top (but they would be even better with some maple syrup). One of my old friends told me these look gross, and I cannot wrap my head around that. Well, this is also a guy who thinks bananas are disgusting, so I won't take his judgment too seriously. 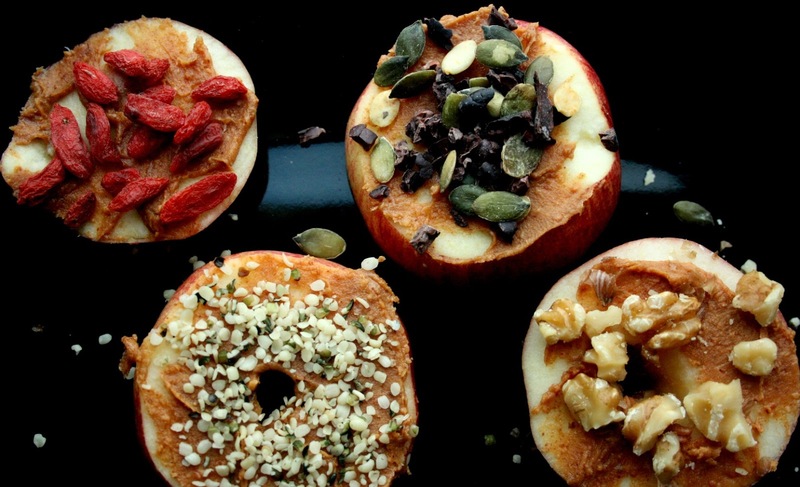 To me, these apples with peanut butter and nuts/berries/seeds look super scrumptious - which is also how they taste. I know peanut butter and apple might seem like a strange combination, but within the online world of clean eating they are definitely in the top 5 of most popular snacks. Still don't believe me? I challenge you to watch three popular videos with 'healthy snack ideas' on YouTube, and I'm almost one hundred percent sure at least one of them will have this combination in it. I topped mine off with some superfoods to make it more filling (I eat them for breakfast, not usually as a snack). Ingredients: apple, peanut butter, and any nuts/berries/seeds you like - I used goji berries, cacao nibs, pumpkin seeds, hemp seeds, and chopped walnuts. I eat this oatmeal when I have to stay full for longer or when I have a tough gym session planned. With the banana, oats, and pumpkin seeds, it is an energy bomb that will make sure you won't be hungry again any time soon. There is banana mashed into the oatmeal to sweeten, but also some on top for texture and decoration. 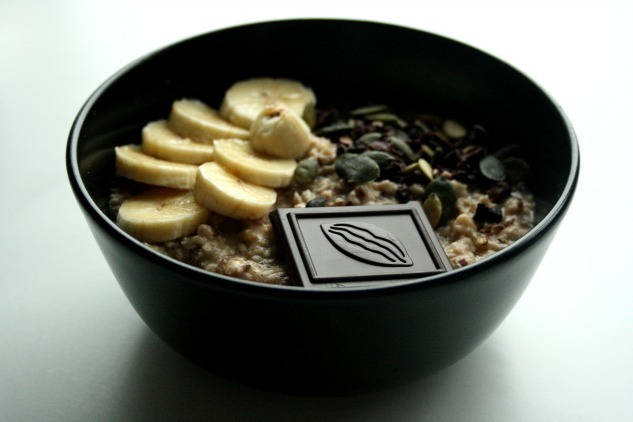 Ingredients: unsweetened almond milk, oats, banana, pumpkin seeds, and extra dark chocolate. If you make any of these or anything inspired by it, let me know by posting it on Instagram and use @veggiesandvanilla in the description. I'd love to see your wintery breakfast creations!